UPDATE, 9/29/2018: Father Nix responds to Abp. Aquila's public statement here. DENVER (ChurchMilitant.com) - A Denver priest in good standing is homeless after being blackballed by his archdiocese. For the past four months, Fr. David Nix, author of the blog Padre Peregrino, has been petitioning Denver Abp. Samuel Aquila for an assignment. His appeals have been met with silence from the chancery. Church Militant spoke with Fr. Nix on Thursday about his situation. Nix explained that he has fallen into disfavor with Abp. Aquila for revealing eucharistic abuses and, more recently, potential misconduct with minors that has occurred in the archdiocese of Denver. "This really started with blowing the whistle on the Eucharist first," he said. Beginning in 2012, Fr. Nix wrote a series of letters to Aquila, alerting the archbishop to a raft of eucharistic abuses taking place at various parishes where he was assigned, including at least one case of theft of a Sacred Host. His attempts to enforce eucharistic orthodoxy provoked the ire of his fellow priests as well as various parishioners. Archbishop Aquila's only response came in a September 2014 letter accusing Fr. Nix of not getting along with his fellow priests. "In light of these concerns, I want to assure you that you will continue to have faculties for celebrating Mass and for hearing Confessions. However, due to these concerns, I do not believe that you can be assigned to parish ministry or serve in a parish," wrote the archbishop. As a result, Fr. Nix said he was "forced to farm myself out" to other dioceses — most recently, the diocese of St. Augustine, Florida. But in March, he returned to Denver to care for his injured mother. At the end of May, Aquila asked Fr. Nix how his mother's recovery was progressing. Nix responded that his mother was doing well. "That was my indication that I was ready to move on to either religious life or as a diocesan hermit or to take an assignment," he told Church Militant. But no assignment came. "Archbishop Aquila’s team assured me that I was in good standing, and gave me permission for this one week of ministry," he said, noting the letter "is the last correspondence that I have heard from his office." "In fact, one reason I left the religious order in Kentucky ... is that I had no proof that the archdiocese of Denver ever handed over my paperwork of good standing for anything more than one week," Nix added. The young traditional priest believes Abp. Aquila is penalizing him for continued whistleblowing. If a bishop doesn't like you, he'll simply blackball you and ignore you and not hand over paperwork even though there are no demerits against you. And that's what's been happening for four months. Shortly after returning to Denver in March, Fr. Nix became aware of two cases of potential sexual misconduct — one involving "a high-power priest" who, in the 1980s, "used to share a bed with a boy." After consulting with an attorney, on May 24 — roughly three weeks before former Cdl. Theodore McCarrick was exposed as a serial sexual predator — Fr. Nix wrote Aquila to inform him of the allegations. "I knew that bringing sensitive information of potential misconduct in today's Church environment, even before the McCarrick scandal broke, necessitated some support from civil lawyers due to the lack of trust between bishops and priests right now," said Nix, explaining his decision to seek legal counsel prior to contacting the archbishop. The day after contacting the chancery, the archdiocese deposited $2,583.82 in back pay into Nix's account. "When I returned to take care of my injured mother, it would have been normal to put me on a salary or at least a retired priest's salary for that time of taking care of her," Nix said Thursday. "But I refused a salary; I didn't want a salary. So they obeyed that, essentially." "What was interesting was that one day after I had brought these reports of potential misconduct, I found back pay put into my account," he added, "when they had not put any money in my account for months prior to that." The next day, Fr. Nix said, Abp. Aquila wrote him, saying, "To be direct, the way you have expressed yourself raises serious civil and canonical implications." The archdiocesan judicial vicar also contacted him, instructing Nix to identify his attorney "so the archdiocese's long-time counsel ... can be in touch with these lawyers first thing tomorrow." Father Nix pushed forward on the two cases. On May 31, he met directly with Denver District Attorney Beth McCann, and on Sept. 10, he spoke with Colorado Attorney General Cynthia Coffman. In the course of these discussions, he learned that officials can't act on the case involving the "high-power priest" because the statute of limitations has run, while the other case has already been reported to police. I've been sending emails to the archbishop and the bishop asking for an assignment; for my letters of good standing to go to the archdiocese of Denver to function as a diocesan hermit or a different diocese to function as a diocesan hermit, or a religious order I was discerning in Kentucky, and they're blackballing me, telling me that I'm in good standing but not giving me an assignment. "It's really important to understand that they're admitting I'm in good standing, but they're not giving me an assignment," he added. "They're admitting I'm in good standing, but ignoring my emails in request for a residence." Unattached to a parish or religious order, Nix has been rendered essentially homeless. Lack of handing over my paperwork seems punitive for having reported misconduct. "My parents would certainly have let me stay in their home, but St. Alphonsus Liguori says the worst thing for a vocation is to live with your parents," he told Church Militant. Ever mindful of his vocation, Nix has heeded the saint's warning; with no other option, he has spent the past four months living in motels, friends' homes — and at times, even his car. Currently, he is in New England, staying temporarily in the home of a priest friend. "The closest home that I could find is on the East Coast," he lamented Thursday. The first thing I'm going to be seeking is back pay for four months of the equivalent of room and board — for groceries, restaurants, occasional hotels. The second thing I'm going to be seeking is cause of action of wrongful discharge in violation of public policy against Abp. Aquila for leaving me without an assignment after reportig misconduct with children. But, as he's receiving just $600 (a retired priest's salary) every two months from the archdiocese of Denver, Fr. Nix is asking for help in moving forward with his claim. He's asking anyone who knows "of an employment law firm in Denver that would do this on contingency," or anyone who would be "willing to provide the financial retainer to me for this lawsuit" to contact him through email at: broen.finn@gmail.com. Father Nix has also started a GoFundMe page to help with expenses. In attempting to join a religious order, I was given paperwork that said I was in good standing for only one week, but a priest can't be in good standing for only one week. So there are obviously games being played with me after blowing the whistle, first on eucharistic issues and secondly on misconduct issues. "Is Abp. Aquila going to admit to another bishop that I'm in good standing?" he asked rhetorically. "And admit is the keyword," he noted. "If a bishop doesn't like you, he'll simply blackball you and ignore you and not hand over paperwork even though there are no demerits against you. And that's what's been happening for four months." In a letter issued Friday, Abp. Aquila responded to Fr. 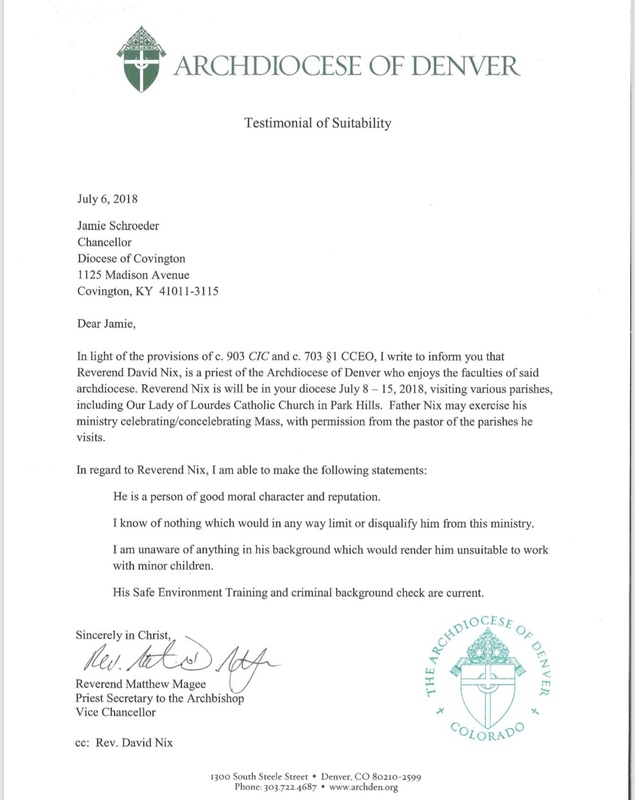 Nix's allegations, suggesting the young priest "causes trouble" because he is "over-zealous in his belief that many people are too casual in matters of liturgy and doctrine." "We have tried to speak with Fr. Nix, but he fails to show up for scheduled meetings, is hard to get ahold of," added the archbishop. "Lack of handing over my paperwork seems punitive for having reported misconduct," he told Church Militant. "Sometimes, conservatives are just as slick as liberals at hiding stuff," Nix added. "We shouldn't canonize anybody before they're dead."